To celebrate the end of the year, we are happy to announce our December deals: save up to 50% on our audio plugins and bundles! The offer will end on December 31st, don't miss it! You have just purchased a plug-in from us? Don't worry: existing customers who purchased before December 1st are granted 20% additional discount on the entire catalog: check your email! We are very excited to announce that Blue Cat's PatchWork 1.6 is now available as a standalone application, in addition to all existing plug-in formats! 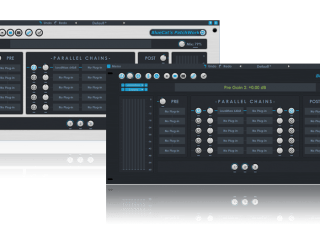 This new application is the fastest and lightest host that can quickly load your favorite effect plug-ins and virtual instruments. This new version also bring several improvements for the plug-in (read more on the PatchWork page. More information about the application is also available on our blog. This update is of course free for existing customers and can be downloaded from the same page as the original full version. Enjoy! Blue Cat's PatchWork 1.5 and MB-7 Mixer 2.4 are now available! These new versions mainly bring stability, compatibility and interoperability enhancements: you can now load more plug-ins, on more machines! The new PatchWork plug-in also supports MIDI FX Audio Units and can be loaded as a MIDI FX in Logic Pro X, as shown on our blog. As usual, this update is free for existing customers and can be downloaded from the same page as the original full version. Enjoy! We are happy to announce that Blue Cat's Plug'n Script 1.1 is now available! This new version of our scripting plug-in mainly adds MIDI FX support for Logic Pro X, new controls in the user interface, new audio file playing and recording scripts, as well as new programming interfaces for scripters and several bug fixes! You can read more details about these new features on the blue cat audio team blog, or on the Blue Cat's Plug'n Script page. The special introduction offers are still available, until October 15th. Don't miss it! Got some time to play with our latest scripting plug-in lately? You will be happy to know that you can now share your custom scripts in our dedicated repository on GitHub. We have included there all factory scripts for reference, and your own creations are now welcome! Musicalentropy has already shared a couple of great scripts: several modulation effects (check out the Leslie! ), non linear processors and famous filter emulations. Now show us what you can do! 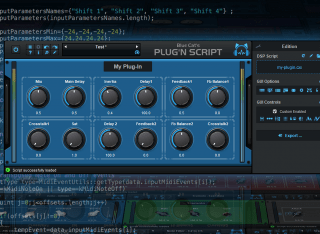 We are happy to unveil today Blue Cat's Plug'n Script, a very particular scripting plug-in that can be programmed to quickly build custom audio and MIDI effects or virtual instruments without quitting your favorite DAW software. With this plug-in, you can write your own processors or instruments, with very little knowledge about programming: it brings an entire development environment into your favorite DAW. It also includes 46 scripts and 120 factory presets for non programmers to use it as a multi effects processor. Read more about it on the Blue Cat's Plug'n Script page! A special introduction offer (25% off) is available until October 15th. Also, special offers are being sent to existing Blue Cat Audio customers: check your email! Hats off to SatYatunes once again! 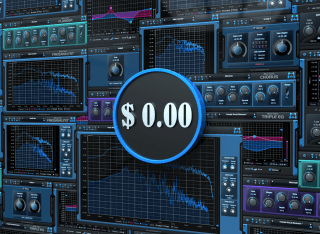 He has created a new set of skins for Blue Cat's Free Pack, and he has decided to share them with you for free: that's 6 free skins for 6 free plug-ins! If you are in the Toronto area this week-end, do not miss the IMSTA FESTA. We will be represented there by our distributor, Music Marketing. The event is entirely free, so don't miss it and make sure to check out our booth! You can register now on the IMSTA website. 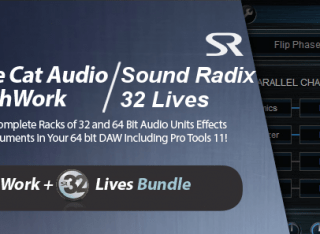 We are pleased to announce that we have teamed up with Sound Radix to create the PatchWork+32Lives bundle, that includes both Blue Cat's PatchWork and Sound Radix's 32 Lives, with 27% discount. With this bundle, you can now mix both 32-bit and 64-bit Audio Units and 64-bit VST plug-ins in 64-bit Mac applications such as Pro Tools 11 or Logic X. 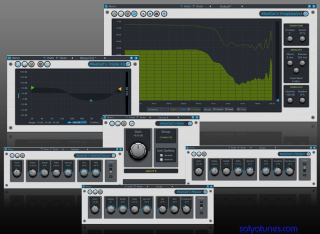 Your older plug-ins can now be resurrected! 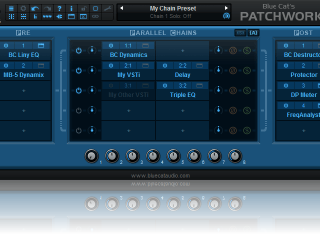 Blue Cat's PatchWork 1.4 is now ready for download, including MIDI channel filtering for plug-ins input, parallel processing chains improvements (selectable summing mode and solo buttons), plus several compatibility improvements on Mac. Full change list is available on the plug-in's page. Satya Choudhury (aka satYatunes) strikes again! A new set of skins for Blue Cat's PatchWork is available for download, including dark and silver themes. Check out his work and please consider making him a donation if you like it! Blue Cat's MB-7 Mixer 2.3 is now available, mainly bringing Audio Units hosting support as well as several compatibility and performance improvements (see full list on the MB-7 Mixer page). For registered users, the update is free and can be downloaded from the same place as the original full version (link received by email). We are glad to release Blue Cat's PatchWork 1.3, available for download right now! This new version mainly brings Audio Unit hosting for Mac users, as well as copy/paste enhancements that have simplified moving plug-ins in the signal chain or between applications. Several compatibility and performance improvements have also been included in this new release. Check out the plug-in's page for more details about changes. As usual, existing customers can download the updated version from the same page as the original full version. 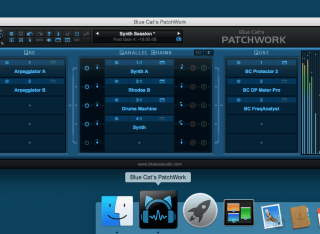 We are happy to announce that Blue Cat's PatchWork 1.2 is now available. This new release mainly adds internal MIDI routing capabilities and mono to stereo processing, and the same enhancements as Blue Cat's MB-7 Mixer 2.2 (plug-in renaming and compatibility improvements). More details about the new features can be found on the plug-in's page. You can now route MIDI events between sub plug-ins (and the host) and build your own MIDI chains inside the plug-in! 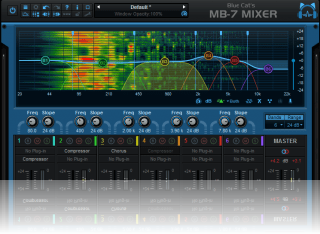 Blue Cat's MB-7 Mixer 2.2 has been released! With this new version, you can now rename plug-ins instances and benefit from several performance and compatibility enhancements (full list can be found on the MB-7 Mixer page). For registered users, the update is free and can be downloaded from the same place as the initial version. We are happy announce new versions of 8 of our plug-ins: Blue Cat's Dynamics, FreqAnalyst Pro, MB-5 Dynamix, Remote Control, StereoScope Pro, and the Parametr'EQ series have all been updated to fix a few compatibility issues and improve the experience on newer systems (full list of improvements is available on each plug-in page). The update is free for existing customers, and the new version can be found at the same place as the initial download that was sent by email. We wish you all a happy new year! May 2014 bring you anything you desire, and more! In order to give you a good start, we are releasing an update for 12 of our plug-ins, including the 6 freeware ones from our Free Pack: Blue Cat's Chorus, DP Meter Pro, Flanger, FreqAnalyst, FreqAnalyst Multi, Gain Suite, Liny EQ, Oscilloscope Multi, Phaser, Protector, StereoScope Multi, Triple EQ. New versions include new copy/paste capabilities, memory optimizations, Audio Suite support for Pro Tools (Liny EQ) and many other enhancements and fixes (details on each product page). These improvements were already included in the latest version of Blue Cat's MB-7 Mixer and Blue Cat's PatchWork. Looking for older news? Please consult the 2013 News page.